Solidworks 3D models is a highly prevalent Computer Aided Design (CAD) software in the AEC industry. In the design sector, Solidworks is used to create the most efficient and fantastic 3D models. It helps in transforming ideas into reality. Did we mention high level of accuracy? The best thing about Solidworks is that it is easy to use and designers can make modifications to the design at any given phase of the design process. BluEntCAD experts have highlighted the significance of RealView graphics and PhotoView 360. While the former assists in visualizing designs in real time frames, the latter aids in developing brilliant photorealistic renderings and animations. Solidworks 3D models is a powerful dynamic that enables designers to showcase the designs become it actually comes to life. Not only this but it even displays the most excruciating details. Do you what this means? Every minute error is extracted from the above process automatically way before a countless number of prototypes are built! This in turn ensures the entire design process saves both time and money. Once the errors are detected it gives designers ample time to quickly make the necessary changes and solve the challenges more effectively and efficiently. The estate agents are able to use this to their advantage by communicating the ‘perfect’ designs to their potential clients. Do you know that Solidworks is used by a gazillion companies for design development? It is used for the entire process and in various situations and environment. Most of the companies in the AEC industry consider this software to be an efficient tool that help the clients to visualize the designs quite effectively. The changes are made as per the client’s request at every stage and different scenarios of the design development process. BluEntCAD puts immense weightage on Solidworks. This amazing software enables the team to create the most quality defined designs in the shortest of duration. The designs are tested in real time and in various scenarios and environments making the whole process a lot more productive and brilliant. The modifications required is applied to the 3D models way before the completion process and at every stage of the operations. It makes the entire design development process more flexible and economical. Solidworks 3D models is super easy to create and the software takes care of all the technical aspects. This allows the designers to not put all their focus on the mathematical complexities and dimensions. Their aim is to create the most unique and fantastic 3D models. BluEntCAD team believes in developing 3D models that are realistic and as per client’s needs. The attention is given to minute details and innovation. Solidworks helps them to meet these requirements. There is seamless accessibility of data amongst every team member and stakeholders involved in the project. Everyone involved in the project are on the same page as there is an efficient sharing of 3D models and 2D drawings. This allows a great clarity in communication and teamwork is at it’s optimum level. It makes it easy for the project members to work as a team utilizing this single platform. Automate workflows is quite an advantage that ensures the construction project is completed on time and within the designated budget. Did we mention the high level of accuracy? One of the most valuable benefits of Solidworks 3D models is the accuracy. The above mentioned advantages validate that the process is simplified and leaves very little room for mistakes to occur. However, all the errors or inaccuracies are captured very early in the design development stage. This not only improves productivity but also helps in creating the most perfect 3D models. 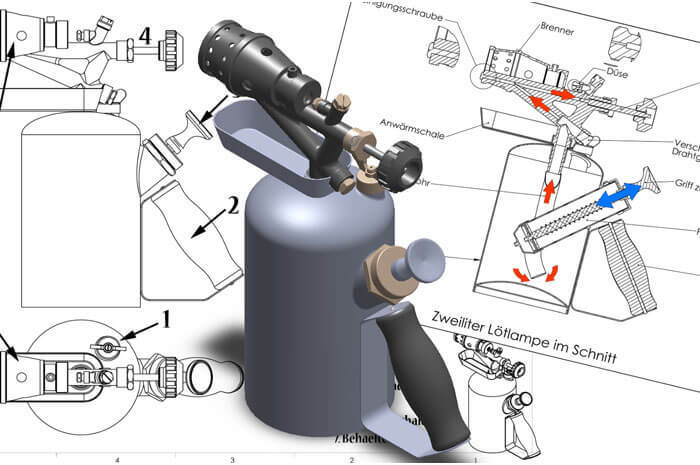 Solidworks 3D models has allowed BluEntCAD to meet client’s expectations and give them more than required or expected. The designers have been able to meet very specific needs. This software helps in automating the design process that allows the designers to retain the design knowledge and rules. These that are gathered from one project are reused to develop more innovative and original designs in a stipulated time and in a cost-effective form. Solidworks assists BluEntCAD professionals to generate the most intelligent solutions when it comes to designs. Since the technical aspects and complexities are taken care of, the 3D models are super accurate. The outputs are consistent throughout hence decreasing the risk of expensive mistakes and issues. Want expert advice on creating the most unique and accurate 3D models? Connect with BluEntCAD to learn more about Solidworks and how it can add value to your next construction project.